Check out the Ignition Gallery video by clicking here: Ignition Gallery YouTube Video. 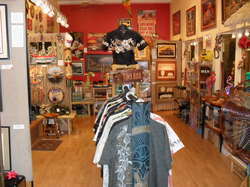 Take a Google virtual tour inside Ignition Gallery by clicking on the image below. 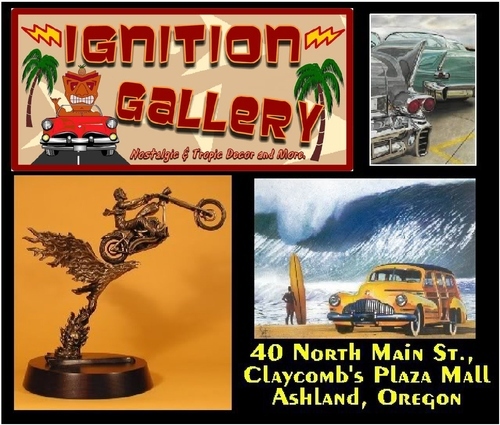 Ignition Gallery specializes in car and motorcycle artworks as well tropical/nostalgic decor. Artworks by over twenty artists, both regional and national, fill the space. The gallery offers originals, limited edition prints, and sculptures. Ignition Gallery will be hosting a First Friday Art Walk on December 7th. Stop by Ignition Gallery and check out recently arrived artworks. Local artist John Spetter of Williams, Oregon has an excellent limited edition canvas print of an Alfa Romeo. We also have several new framed Zombie prints by Doug P'Gosh. 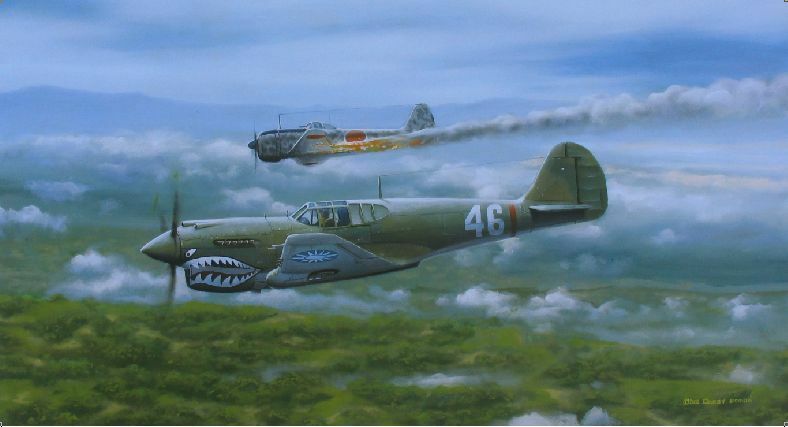 Plus some great framed aviation art by Darby Perrin. We currently have on consignment a great Scott Jacobs Harley Davidson artwork "Catch of the Day". Ignition Gallery has expanded! We now have an adjacent space called Ala Kalika with an exotic collection of rugs and lamps, plus artwork by Ashland artist Pegi Smith! The website for the space is www.alakalika.com. This website is not geared for internet sales, but we do ship. If you are interested in purchasing any of the art please contact us for prices and further information. Purchases can be made via personal check, phone order on your credit card, or through PayPal.